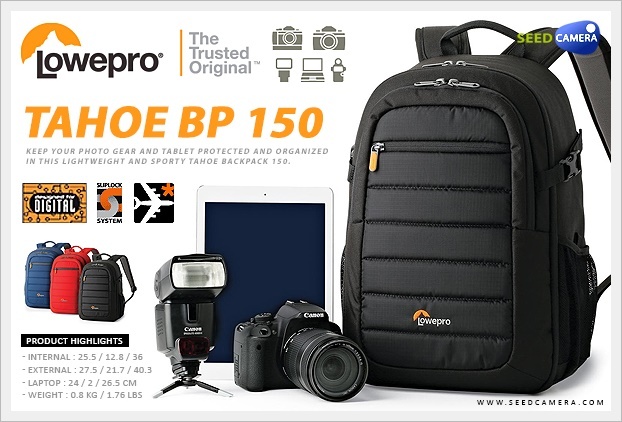 Tahoe BP 150 - Keep your photo gear and tablet protected and organized in this lightweight and sporty Tahoe Backpack 150. Description : An active life needs a focused pack. That's what the Tahoe BP 150 offers. Its customizable and well-padded main compartment and roomy front pocket offer plenty of storage for a day's worth of essential gear, including a tablet. - Spacious and adjustable interior features padded dividers to easily customize camera kit. - Main compartment features an UltraFlex™ panel that folds down to create more space for personal gear and less camera gear, or whatever your day calls for. Remove all interior dividers and use Tahoe 150 as a full daypack. - Light grey interior makes it easy to locate and store gear. - Roomy pocket includes organized storage for daily essentials, plus a protective CradleFit™ pocket for up to a 10-inch tablet. - Subtle and zippered outer pocket offers space for earbuds, pens, keys, smartphone and smaller items. - Tall, stretch-mesh pockets accommodate large water bottles or other quick-grab items you want throughout the day. - Convenient grab handle provides an extra carry option. - Softly padded shoulder straps adjust for a comfortable fit. - Weather-resistant materials help safeguard your gear from the elements.